Story of a Wast German spy who is a new recruit and is assigned an espionage assignment in West Germany but his naive sense of decision making constantly puts his cover in danger, forcing his agency to resort to certain extreme measures. 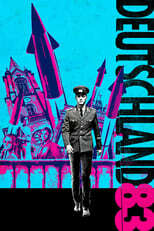 Where can you stream Deutschland 83? On 2015-06-17 Drama TV Series Deutschland 83 first aired on RTL. Written and created by Anna Winger, and produced by UFA Fiction & RTL, Deutschland 83 will return and was last broadcasted on 2018-10-19.